At times of economic uncertainty, demand for stocks tends to decline, leading to lower than typical stock prices relative to their book value, or liquidation value (low price-to-book, or P/B). The media tends to be negative about stock investments, and recommends rethinking your stock allocation. Contrary to the media’s message, this article demonstrates that returns following low P/B tend to be higher than typical. The analysis was done for QAM’s stock portfolios Long-Term Component & Extended-Term Component. The results may be different for different portfolios. The time inspected involved 14 years, and is not statistically significant. The future may show very different results. Read below to see the limited applicability of the results. All annualized returns were positive and high. The returns were higher than typical, with averages of 33% & 52%. 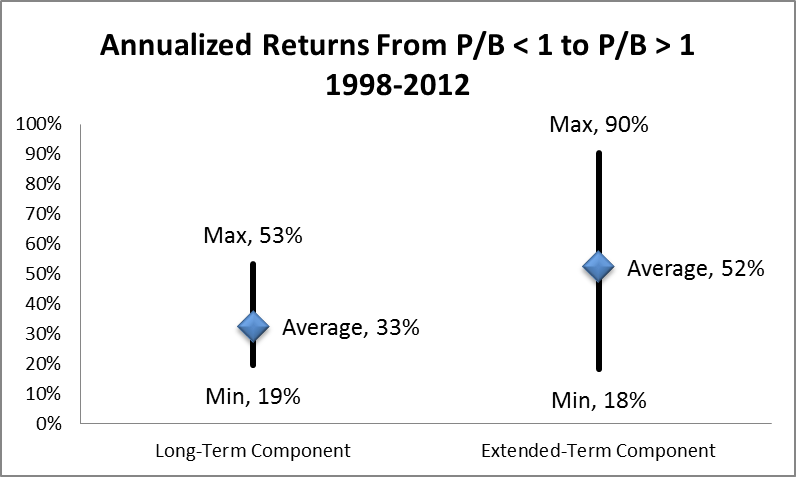 The P/B recovered quickly – typically in one year, leading to high returns in 1-3 years. What you shouldn’t do, given the lack of statistical significance? Do not try any market timing based on this data. Do not take any risk that you wouldn’t take normally with stock investments. How can you use the results to your benefit? When the media recommends reducing the stock allocation, check the P/B of your QAM portfolio. If it is below 1, there is a possibility for unusually high returns in upcoming years. You can stay strong sticking to your plan when others are telling you to bail out. If you keep varying levels of cash, or debate taking a mortgage loan for the purpose of investing, and, financially speaking, you can clearly tolerate the short-term risk, seeing P/B < 1 should make you feel comfortable that the risks may be lower than typical. 1 In most cases, the P/B turned greater than 1 within one year – in such cases this column is left blank.